If you have a frequently used file folder, you can add folder to Windows 7 Favorites folder shortcut list to reach this file place rapidly using your Windows Explorer application. Favorites Folder is time saving especially the file folder is in multiple levels deep on root folder. 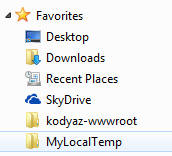 To add a folder in Windows 7 Favorites folder in Windows Explorer, first launch Windows Explorer. Then go to file folder that you want to add to Favorites group. After you are in target file folder, on the left side of the Windows Explorer you will see Favorites section. Right click on Favorites node and display context menu for Favorites. Choose Add current location to Favorites menu option as seen in below screenshot. After you complete creating the file folder shortcut within Favorites in Windows 7 Windows Explorer tool, you will see the folder name under Favorites node. If you click on folder name, you will be directed to the location of the file folder in Windows Explorer tool.